How does that saying go? Save me, Jesus, from your followers? One could argue that the conservative tradition needs the same kind of help. The roots of the current culture war aren’t hard to find. I’ve written previously about a class-based campaign that goes back more than three decades, to the days of Ronald Reagan and Margaret Thatcher; while that campaign’s being fought on many fronts, it’s especially instructive to watch the ways it’s playing out in present-day Canada. As Conservative strategist Rod Love told author Lawrence Martin, Harper and other Reformers seethed – and rightly so – at the way the Chrétien-era Liberals framed them as the lunatic fringe. “Others got over it,” Love observes in Martin’s book Harperland. The same description surfaces over and over. Stephen Harper doesn’t want to beat the other side; he wants to destroy them. They’re not opponents; they’re the enemy. As for the depth of his ideological feelings, the prime minister’s colleagues use the word “hatred” to describe his antipathy to liberalism. When politics is everything, when opponents are enemies, when there’s hatred in your belly, certain things follow. Ruthlessness, for one. Personal attacks. A refusal to accept the legitimacy of different views and to work with those who hold them. Rather than workable solutions, my party is offering low taxes for the currently rich and high spending for the currently old, to be followed by who-knows-what and who-the-hell-cares. This isn’t conservatism; it’s a going-out-of-business sale for the baby-boom generation. I’m reminded of what they say about stopped clocks, but never mind that just now. Back again to Stephen Harper’s determination to remake the country in his own image. Whatever this is, it isn’t conservatism. Certainly not in the tradition of Conservatives such as Bill Davis, Joe Clark, David Crombie, Dalton Camp, Flora MacDonald, or any number of decent and honourable people who’ve carried the Tory label. Above all else, we need to be vigilant about the word and its meaning. If Harper and his people want to rewrite the national narrative, that’s up to them, but we owe it to ourselves to demand nothing less than clarity and intellectual honesty from them as well as from ourselves. This entry was tagged citizenship, civicengagement, conservatism, edmundburke, framing, language, presumption, publicdiscourse, publicsphere, stephenharper, winningbackthewords. Bookmark the permalink. 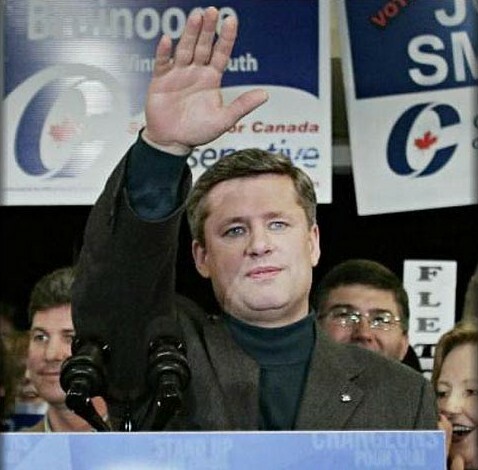 You might want to get your facts right about and post the real Harper quote instead of repeating a Liberal attack ad: the real quote is here and not nearly the same.he said this at the Conservative conference in 2004"We can create a country built on solid Conservative values, not on expensive Liberal promises, a country the Liberals wouldn’t even recognize, the kind of country I want to lead."